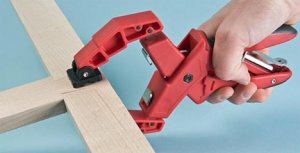 If you ask any woodworker to make a list of tools they need, high on their list you are sure to find clamps. It doesn't matter how many clamps a woodworker owns because at one point or another he will find out that he needs more. But it is not always about quantity, it is sometimes about size. That's why these adjustable clamps might be a nice addition to your shop. I spotted these cool adjustable clamps in the Lee Valley catalog. They got my attention because they are both adjustable, and they also offer a 1:1 pressure ratio based on your hand squeezing pressure. The jaws on these clamps can open up to about 5-1/2-inches and have a throat depth of 2-inches. The clamps are made out of glass-filled nylon, with nylon jaws, and a steel lock with quick release. Unfortunately Lee Valley doesn't tell us who makes these clamps, but Lee Valley usually sell high quality products so we have little to worry about. The clamps go for $8.50 each.